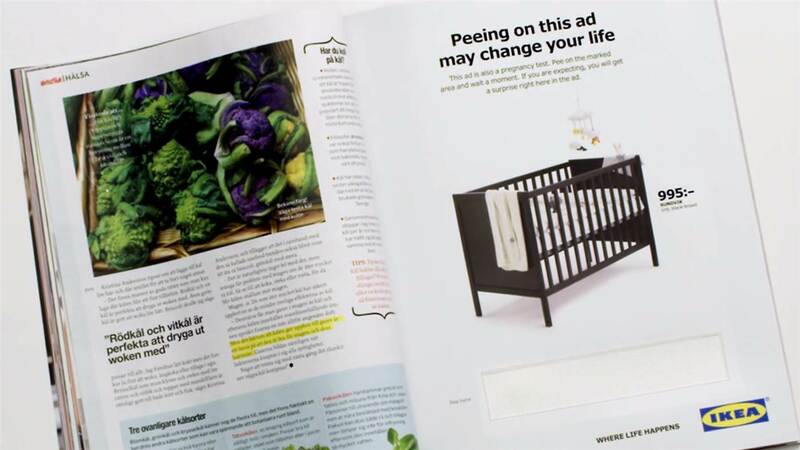 If you pee on this IKEA ad, you might get a discount. No, really. Okay, we’re not even kidding. Some clever ad agency has come up with an ad that doubles as a pregnancy test, revealing a slightly soggy discount if there’s a baby on the way! The ad is for Swedish furniture giant IKEA, specifically for a baby’s cot, and the page is printed with the sort of chemicals usually seen in actual pregnancy tests. In fact, the page is a pregnancy test! We’re not going to lie, the combination of capitalism and flatpack furniture is kind of weirding us out. The cot is usually 995 Swedish krona (around $150 AUD), but the price drops to 495 KR ($76 AUD) if you are up the duff! The ad is currently being run in Swedish women’s magazine Amelia and the agency involved, Åkestam Holst, is being lauded for their innovation. There are apparently no plans to extend the ad to other countries, at this stage. IKEA and their agency partnered with Mercene Labs to turn concept into reality, and produced a video to show how it all came together. They say they created the pregnancy test page painstakingly, with a firm eye on quality – and some help from pretty amazing technology. “In order to make the interactive functions of this ad work in reality, we had to make several technical advancements. The pregnancy test strip was used as a starting point, which relies on antibodies that bind to the pregnancy hormone hCG, resulting in a color change,” a Åkestam Holst rep told Ad Week. Obviously this is a quirky bit of ingenuity, designed to go globally viral, and the fact that its contributing to better diagnostics is pretty great. Before you get very, very stroppy about this (in case you are the outraged kind, or didn’t sleep last night), it’s good to note that people are probably not going to use this as their first port of call to confirm a pregnancy. That said, what are your thoughts on this? Can you really imagine tearing the page out and weeing on it, to get half-off a cot?! I mean, maybe you can. You do you! Chat about this with us, over on our Facebook page.